An artificial sensory nerve system created by researchers at Stanford University and Seoul National University gives hope for artificial skin for prosthetic limbs, restoring sensation to amputees, and giving robots human-like reflexes. 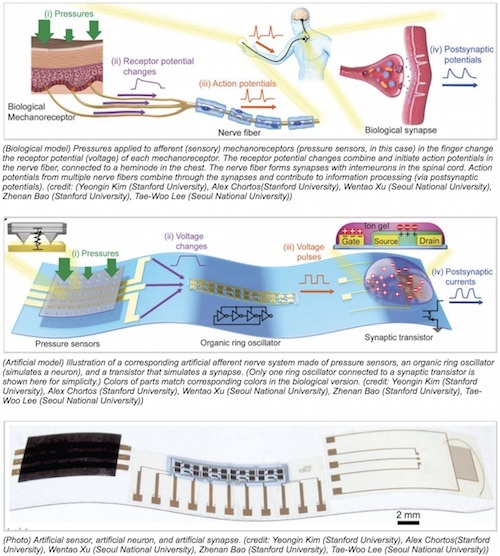 Their rudimentary artificial nerve circuit integrates three previously developed components: a touch-pressure sensor, a flexible electronic neuron, and an artificial synaptic transistor modeled on human synapses. I'm pretty sure I read about the idea for this In Roger Zelazny's Hugo award-winning 1966 novel This Immortal gives sf fans a pretty accurate prediction of this idea. A realistic, soft skin wrestling robot uses special skin described as a radar mesentery to sense its opponent. This permits the robot to judge within ounces how much pressure to apply in a wrestling hold.